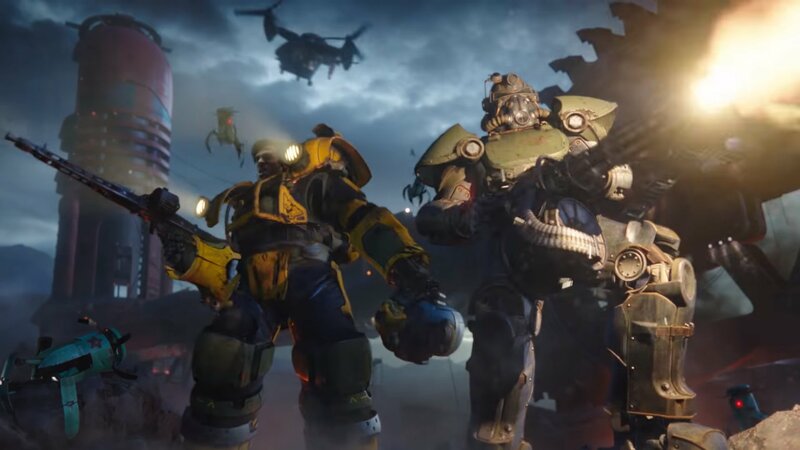 With Fallout 76, Bethesda Softworks took one of its biggest leaps by tweaking the proven Fallout formula, and turning it into an online, multiplayer experience. It’s a move that fans have been hungry for since almost as long as there have been Fallout games, and only a few short years after Fallout 4, it has arrived. Unfortunately, Fallout 76 may not be what most players were hoping for, as most of what makes the Fallout series special has been removed to make way for multiplayer features, leaving the world feeling empty, lifeless, and oftentimes boring. Fallout 76 takes place in 2076, the 300th year anniversary of America declaring its independence as a country, and in the aftermath of a nuclear apocalypse, you’ve been tasked with rebuilding America from the rubble and radioactive waste that remains. Beyond this initial premise, Fallout 76 offers little in the way of story. There are no NPCs to interact with, no moral decisions to make, and none of the usual towns and social spaces you’d expect from the Fallout series. Instead, the world is empty and occupied almost exclusively by hostile life and other players. This decision is intentional, of course, as the vault from which you hail represents the first group of people to enter the outside world since the apocalypse. Instead of NPCs, you’re meant to interact with real-life people, forging friendships, killing monsters, looting areas, and fighting off other hostile players. Though you never actually speak with anyone in Fallout 76, there are plenty of quests to complete and problems to solve, which are given to you through holodiscs, computer files, and robots who essentially serve as “quest vendors.” It’s a little awkward receiving quests from recordings and handwritten notes throughout the entire game, but the actual content of those quests is what you’d expect from the series. You’ll fight off hordes of enemies, explore long-abandoned places, and generally do what you can to fight back against the forces of the apocalypse. That said, Fallout 76 never actually does anything that comes close to telling a story or having a cohesive narrative whatsoever, and that’s a letdown no matter how you slice it. The best way to explain Fallout 76, is that the game has stripped itself of a lot of components that players love about the series, including the story, interesting NPCs, and the impact one feels from being a part of the Fallout world, including making choices with far-reaching consequences. Instead, it offers a massive world to explore and invites you and your friends to tell a story of your own. If you have a group of friends at your side, Fallout 76 offers an awesome opportunity to shoot, loot, and tour all that post-apocalyptic West Virginia has to offer. The lack of NPCs and focused narrative aren’t so much of a problem when you’re laughing at the ridiculous vampire costume your friend is wearing, and screaming like a child when a giant sloth monster surprises you. If you play Fallout 76 alone, on the other hand, it is oftentimes a truly unbearable experience. You’ll feel incredible alone, with minimal opportunities to interact with other players on a huge map which hosts only 20 players at a time. When you do meet someone, they’ll probably ignore you, but if they don’t, they’re likely to shoot you for some quick XP, especially if they’re already in a group. The world itself also seems to have been balanced for groups, and exploring alone often proves to be unfairly punishing. In short, if you’re going into Fallout 76 expecting something similar to Fallout 4, which is meant to be enjoyed alone, you’re going to be very, very disappointed. On the other hand, if you tend to enjoy cooperative multiplayer experiences and have always been turned off by Fallout single-player focused experience, Fallout 76 might be for you. If there’s one thing that Fallout 76 does well across the board, it’s worldbuilding and environmental storytelling, which is important in a game with no real dialogue and a main storyline that feels like it barely matters. Post-apocalyptic West Virginia is bigger and more diverse than any Fallout map to-date, with misty swamps, vast forests, rocky mountains, deserted cities, and more. Each area has a unique history built into it and its own story to tell for those willing to search for it. Bethesda’s success in this regard is a crucial factor that sometimes makes playing Fallout 76 a lot of fun, in-between all of the frustrating glitches, boring solo experiences, and other annoyances that hold it back so very much. There were many times where I found myself really enjoying exploring the world and thought, “You know, this game isn’t so bad.” But almost every time that happened, it was followed by some bug or irritating game mechanic that pulled me out of the moment. Aside from the core premise of the game being a massive deviation from the series at-large, Fallout 76 has a lot in common with the Bethesda-made Fallout games that came before it. For example, the Pip Boy menu, The S.P.E.C.I.A.L. attributes system, the V.A.T.S. combat assistant, and the settlement building feature all make a return in Fallout 76, which gives the game a very familiar feel to those who spent hours lost in the Commonwealth of Fallout 4. One of the bigger changes is the leveling system, which is now a card-based perk system that allows for more character customization than ever before. Want to focus on buffing your teammates through support-based Charisma skills? Go for it! Want to become the team’s loot mule by increasing carrying capacities with Strength skills? They got you, fam. There’s also the new CAMP system, which lets you build a small settlement wherever you want in the world and use it as your base of operations; then for a small fee, that base can be relocated wherever you want. This makes crafting, cooking, healing, and storing your loot a breeze, since your base is never far away. This becomes incredibly important in Fallout 76 as fast travel isn’t as easily accessible (only available when teleporting to a fellow teammate), and crafting and weapon/armor maintenance have never been more important in a Fallout game. And of course, it wouldn’t be a Bethesda game without an abundance of glitches, big and small, to complement the experience. Fallout 76 uses the Creation Engine, which is now seven years old, and its age shows in a big way. It was never particularly stable to begin with, but with Fallout 76, it is particularly unstable. I found myself having to reboot the game when a quest bugged out and wouldn’t let me progress, and on one occasion I was killed when I ran over a small rock at a weird angle, which somehow propelled me into the air and to my death. Glitches like this are rampant in Fallout 76, and unlike previous Fallout games, there’s no reloading to a previous save to protect you. If you get killed in an unfair way, you lose the loot you were carrying. If the game crashes and you have to reload, you’re gonna lose any server-specific assets like workshop camps you’ve taken over and any resources housed therein. So far as I can tell, the glitches in Fallout 76 aren’t any worse than they’ve been in previous titles, but the increased stakes and unforgiving nature of an online environment makes those errors less funny and more infuriating. The datedness of the Creation Engine also rears its ugly head where visual presentation is concerned. Even accounting for the fact that Fallout 76 is an online title, the game is by no means pretty. Though the worldbuilding is immaculate, the world itself only looks good at a distance. Upon anything resembling closer inspection, the world is mostly low-res, poorly detailed, or even downright ugly. Thankfully, the sound design and soundtrack saves the day with upbeat oldie tracks playing in the background, while bullets fly and creatures roar. Listening to the soundtrack and hearing ghoul faces explode when my bullets met their head are some of the primary motivators that kept me coming back for more, despite the game’s faults elsewhere. Fallout 76 is sure to be a divisive game. I’m confident that most people won’t be able to forgive its many flaws, especially those going into it expecting a solo experience similar to Fallout 4, but I also think that those looking for a multiplayer Fallout experience will get a kick out of Fallout 76, particularly once Bethesda patches some of the game’s most glaring bugs. As much as I’d like to be able to tell you that this title is terrible or amazing, the truth is that it’s just okay.